This is the second of a series of posts from the Indonesia. Keith Ellenbogen, a photographer and frequent contributor to the Global Explorers Blog, is sharing pictures from an expedition with Conservation International (CI) and the Ocean Health Index to create an awareness about environmental threats and solutions that impact the relationship between people and the sea. 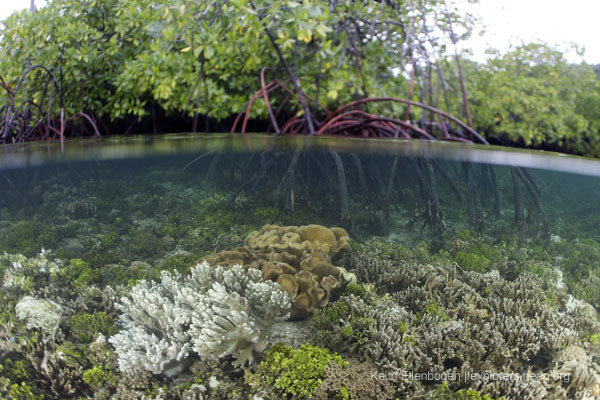 Mangroves and coral reefs are intricately connected. 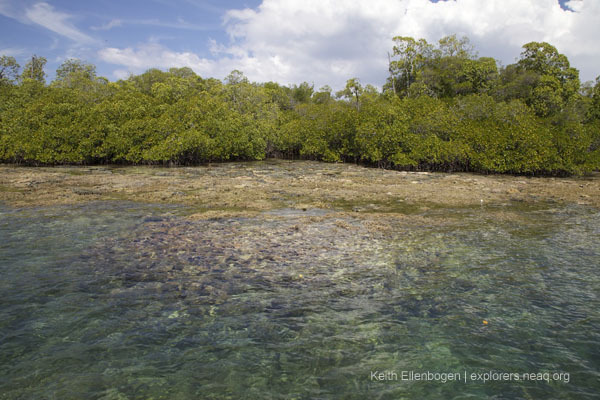 The mangroves provide shelter to many juvenile fish and are an important zone between coral reef habitats and land. 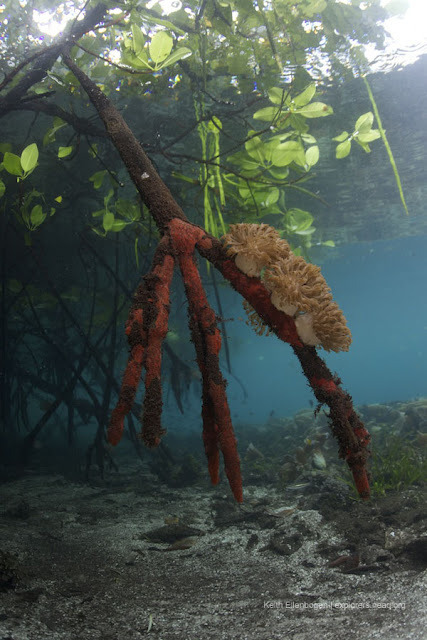 I was not only interested in photographing the natural beauty but also working to create images that visualize the connection between mangroves and coral reef ecosystems. As part of this expedition we spent many hours in shallow water mangroves searching to explore habitats where corals grow on the roots of mangroves. The focus of these images were to visually show ‘compressed’ habitats that can lead to discussions on the interconnections between mangroves and coral reef ecosystems. One question I sometimes asked is why should we care? It's not an easy answer but an excellent example is the photo below. Along the mangroves — extreme exposure at low tide. Heliopora sp. (blue coral) have been listed on IUCN Red List for threatened species. At first it looks just like all the other corals and mangrove images. But this image is shows how life adapts to varied conditions. At low tide the blue coral is exposed to the sun. How does this coral prevent drying out or getting sunburned especially given we are right on the equator? There is research currently underway that is looking to better understand how the coral blocks the sun and how that can be useful for people. This is an example of a possible practical connection between people and coral reefs. Unfortunately, this coral species due to loss of mangrove habitat has just been listed on the IUCN Red list for threatened species. There is so much we just don’t know and so much to learn. Who knows what we will discover, what secrets we will find and what our imagination can create? To learn more about the first part of his trip to the Turtle Islands, click here. Head over to Conservation International's blog for more pictures and perspectives from Keith. Aquarium explorers traveled to Raja Ampat in 2011. 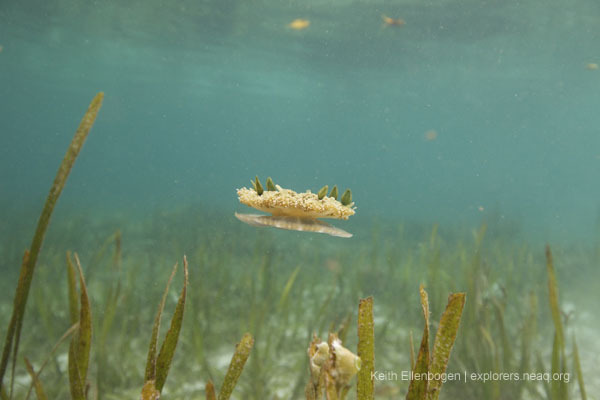 Dive further into this beautiful part of the marine world through the expedition's blog posts.